Some say the Nordic armies at the battle were annihilated. The defeat at Red Mountain greatly troubled Jurgen. He began a hermitage to meditate on "how Strong Voices could fail". After seven years of introspection and contemplation of the history of the Voice, Jurgen finally came to realize that the gods had punished the Nords, and the dragons before them, for their arrogant and blasphemous misuse of the Voice. He was the first to understand that the Voice should be used solely for the glory and worship of the gods, not the glory of men; that it was a means of attaining enlightenment, not a means of attaining power. Armed with this epiphany, he "chose silence" and returned to the world. Thus, the Way of the Voice was born. When Jurgen began proselytizing this understanding to his fellow Nords, seventeen other great Tongues of his era disputed him, and challenged him to combat to prove their point. It is said that Jurgen swallowed the Shouts of these Tongues for three days until they lay exhausted. Afterwards, they acknowledged his superior skill and wisdom, and traveled with him to the highest slopes of the Throat of the World, where Jurgen set his new home, devoting it to the studies of the Way of the Voice as a philosophy of peace and inner balance. The monks who followed him came to be called the Greybeards, who devote themselves to meditation at secluded High Hrothgar. Upon his death, Jurgen was buried at Ustengrav, an ancient fane in the marshes of Hjaalmarch. 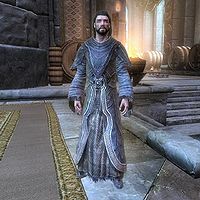 On his tomb in Ustengrav, the word Windcaller is spelled out in the Daedric alphabet. An excerpt in The Improved Emperor's Guide to Tamriel apparently accredits Windcaller with the discovery of the thu'um. ^ a b c d e Arngeir's dialogue in Skyrim. ^ Ennbjof's dialogue from Morrowind. ^ A stone etching in Windhelm placing the date of Ysmir Wulfharth's death in 1E 533. ^ a b c d The Etched Tablets of High Hrothgar.